I’m a writer and I write all day. That’s just what I do. Hi, my name is Bronwen Winter Phoenix, and as we speak I am doing the sensible equivalent of sitting a corner, crying in despair. You see, it’s my book launch in a few days; I still don’t know what I’m doing for it. Oh, I know what I’m doing but… I don’t know what I’m DOING. Let’s flash back to my days as a first-time author, or even before then, as a pre-published author. I still didn’t know what I was doing, but I’ve learned a lot since then. For instance, I know now that where events are concerned, I can only really rely on myself, and that Borders was a great loss to us all. As a child, I was greatly inspired by Stephen King. You see, I’ve always been into horror – which might explain why everything I write now has a dark edge to it, that I just can’t seem to get rid of – and really got a thrill out of being scared. When I was about eight years old, I started reading Goosebumps. It wasn’t long before I realised, apart from the very occasional element of fear, it was… well, it was for kids. I soon started reading the ‘Point Horror’ series – too many clichés and babysitters getting scared by their boyfriends in Halloween garb. So it didn’t take me long to move onto the hard stuff. I was about nine or ten when I started reading King, Koontz and Pike. Still love those guys, and my favourite novel is still ‘The Season of Passage’ by Christopher Pike – a novel quoted as being “the soul-searing novel of horror beyond horror” – I couldn’t get enough of that book. Even the cover – a rotting, skeletal hand holding up a plain gold ring in front of the planet Mars – rocked. So, as you can imagine, a whole new world opened up to me through horror. It was exciting, it was scary, and to be honest, I didn’t always understand all the sexual references, but I loved it. I wanted to be like these strong, (for the most part) faceless storytellers. I wanted that power. So already, at ten years old, staying up late in bed with my night light and horror novels, I kind of knew what I wanted to do with my life; I wanted to be a writer. I began writing. I didn’t have the easiest teenage years, of course (does anyone? ), and I ended up on the wrong path a couple of times, but eventually I got to where I wanted to be; a writer. I’m sure anyone with common sense knows that journalism and fiction are two things that should never be combined. However, for a young writer who needed a career, journalism seemed like a good option. As for the author front, I guess I got lucky. Writing from dreams to start with, the novels just came. Did I mention I have the most unusual, movie-like, graphic and prolific dreams? Well, I do. In fact, I had a fantastic one the other day about Richard Hammond in a zombie apocalypse – a movie I’d actually love to see produced! But moving on… I suppose you could say, my dreams geared me to realise my real-life dreams, and the two kind of went hand-in-hand for a while. Of course, I started with horror. ‘Escaping Dreams’ and ‘Nightswallow’ were mainly horror stories, although none of my work ever fits into one specific genre. 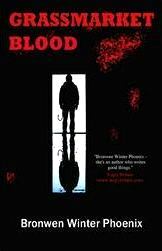 Now, I’ve started to lighten up a bit, which brings me to ‘Grassmarket Blood’. It’s my third novel, and it’s a weird/funny/crime/thriller (still, that dark edge I was telling you about), and it’s the most mainstream thing I’ve ever written. It’s what I’d call frivolous crime. Stanley Hobbes is a neat, quiet, verging on OCD obituary writer for the Edinburgh Times - who usually keeps himself to himself and hasn't had much to say after two years in the same boring job - when he unexpectedly lands a potentially huge story through a ridiculously strange obituary scenario and gets promoted to a 'proper journalist'. When he is sent to report on the Edinburgh Fringe Festival, he meets dangerous Russian dancer Marcella Dimitrieva and gets swept up in the strange and confusing world of the Fringe shows whilst inexplicably finding himself at the centre of a mystery. When the first murder takes place, Stanley feels he has to find some answers, but things just seem to get stranger and stranger. Haunted by his past and mourning the recent loss of his substantial tie collection, is Stanley completely out of his depth? And W.W.D.D - What would Data do? For more information, visit www.bronwenwinterphoenix.com and www.twitter.com/bronwenphoenix?